Theme: Simca – And All This Is Folly To the World. Very reluctantly I have decided to try to make sense of Simca’s slow fade from the market. I have our monthly theme to thank – my interest has been piqued. Up to now Simca has meant little and I didn’t plan to write a lot on the topic. Simon Kearne insisted slightly too. My findings are partly just a bit of editorial reworking of the mess that is already publicly available at Wikipedia. My contribution is to put in some bits about Chrysler and Peugeot. And also to make a DTW exclusive “infographic”. It is barely legible, frankly. The main use has been to explain (to me at least) the chronology of Chrysler/Talbot/Simca’s model terminations. My two research questions were (1) how long did it take for Peugeot to kill off the Simca heritage it acquired upon buying Chrysler Europe in 1977?and (2) what was the reason for Simca’s demise? The answer to question 1 is 10 years. The main reason for that was that PSA inherited the Horizon model, due for launch in 1978. PSA soldiered on with that one for almost a decade. They also inherited the 1307 and wrung some more sales from it by making it a saloon in 1980. Well designed and very British: Talbot do it again! Much to my surprise (now that I read this for myself), the Simca 1100 remained a holdover from the independent Simca days until 1985, it having being designed before Chrysler’s dead hand firmed its grip on the company. The 1100 proved a steady seller too, old though it was. What I also learned was that Simca’s period of real independence didn’t last very long, under 20 years. For a substantial time, it made Fiatoids. For another period it made rubbish conceived by Chrysler (is everything made by this firm some form of dross?) Arguably nothing that came after Chrysler’s takeover had any real merit. Then came the slow amalgamation into PSA which amounted to PSA’s purchase of market share. The only small gift to PSA from the Chrysler/Simca period was the Ryton factory and the 309, a car PSA held at arm’s length by dint of the odd number they gave it. An unloved step child. My tentative analysis is that Simca, as France’s second-largest manufacturer after Renault (the 1950s to mid-60s) was in a position to either be absorbed by Ford (who held shares) or it could have grown and outcompeted Citroen (failing miserably by 1971). Chrysler’s intervention and subsequent welding of Simca to Britain’s undercapitalised mediocrity, Rootes, was the death kiss. Chrysler itself had money problems (it borrowed a lot of money in 1954); it had market problems, it had making-bad-car problems. Corinthian leather. Expanding into Europe only added to those and helped to kill what might have been a viable independent entity. Given the tendency for Chrysler to sully, damage or stymy those it gets involved with, Daimler was lucky to survive its encounter, I note. The general lesson I get from this is (a) avoid Chrysler. It is a value-killing corporate zombie and (b) Opel has under ten years left as a living nameplate, if Chrysler Europe’s experience is anything to go by. There now follows an abbreviated history of Simca, partly pillaged from Wikipedia but also with comments. 1926 – SAFAF was founded, making Fiats, a cooperation between Fiat and M. Pigozzi. 1935 – The SIMCA (Société Industrielle de Mécanique et de Carrosserie Automobile) company was founded in by FIAT and called Simca-Fiat until 1938. 1948 – the Simca 6 replaced the 5 (gradually), not disimilar to an existing Fiat model. In this post-war period Simca’s ability to export was held back by the fact it could not sell into Italy since Fiat was the major shareholder. It was still French exporter number 2. 1951, the Simca Aronde launched, notably not based on a Fiat design. 1954 Simca took over Ford’s Poissy factory, SAF, so production could be consolidated in one plant. In the 1950s, Simca had second place after Renault. At this time Simca also made the Ford Vedette which continued to sell until 1967. In 1958, Simca bought Talbot Lago and at the same time, Chrysler started investing in Simca (15% of stock) in order to enter the European market. The stock was bought from Ford. In 1961 the 1000 was introduced. In 1963 Chrysler increased their stake to a majority. Fiat retained 19% but didn’t exercise any control. This is a turning point, just 12 years after the first true Simca was produced. So starts the rot. In 1967 the Chrysler badge appeared on the cars alongside the Simca badge. The 1100 was introduced with FWD and i.r.s. In 1970 the company name was changed to Chrysler France. The 160/180/2-litre saloon was launched. The fact it didn’t have a name was indicative of its lack of identity. It tanked. Putting Chrysler on everything was an act of corporate stupidity. The Simca name had value. Chrysler stood for nothing. 1975 – the 1307 appeared, under various names in various markets. Only Archie Vicar likes it, and then the British model only. 1977 – Peugeot bought Chrysler Europe, ending a 14 year period under American control. In 1980 the last Simca, the Solara is launched, a booted 1307. The Talbot name carried on until 1987, stuck on the Talbot Solara. Did you make it this far? Well done! It’s an appalling tale of corporate neglect in Britain and France which makes GM’s stewardship of Saab and BMW’s of Rover look diligent and inspired by comparison. The ex-Barrieros operations in Spain were possibly the best achievement, but a closed market helped a lot. The brightest spot was the Simca 1100, but it took eight years to develop the platform into a 1301/1501 replacement. In Britain, the Avenger was an instant success, but plans to stretch it into the R429, a Hunter replacement and Capri rival were thwarted. Instead vast sums were squandered on the 160/180, including an all new engine which was to big and heavy to be of any use in the smaller cars. The smaller French cars were blighted by the rattly old Poissy and 342 engines. Chrysler could have drawn on the capabilities of Mitsubishi, in whom they had a 15% holding, to come up with something better. Instead they used their Japanese affiliates as providers of fully built cars to replace British products in North America and Australia. Perhaps it’s a pity the farce ran so long. The French and British governments were soft touches in bankrolling lame-duck industries, and the lucrative Paykan contract was a life support machine for the UK operation. It’s hard to see any other way for Simca and Rootes’ survival. The chauvinistic French establishment distrusted the Germans and Japanese, and even scared off Ford. British Leyland refused to touch the Rootes operations with the proverbial barge pole. Like Saab and Longbridge Rover at their ends, Simca under Chrysler became an enervated and etiolated brand, drained of the unique spirit and character which gave it its identity and appeal. Isn’t that the Chrysler touch? If we can learn something here, it is that mergers are destructive of brands’ intrinsic character. Thought R429 was just an Avenger Coupe rather than an enlarged model to replace the Hillman Hunter, what is the source for R429 being the latter? Would Simca’s prospects under Chrysler have been any better without Rootes in the picture, especially if Chrysler manages to pull off a successful integration of its European holdings by acquiring another ailing carmaker like Singer (pre-Rootes) or Jowett to built rebadged Simcas (later rebadged Chryslers) in the UK? If not how would Simca be able survive as an independent carmaker? Perhaps Simca could find a way to update the Poissy engines to be further enlarged as well as feature OHC/DOHC and fuel-injection, while it seems there were plans in the works to have the Type 180 feature DOHC. Though there is still the PRV V6 route, one wonders what an independent Simca without Chrysler (or Rootes) is capable of developing its own larger 6+cylinder engines above the potential Type 180 Turbo. Not sure how Mitsubishi’s capabilities could have been used to Simca’s benefit (though there are some aspects for Simca to exploit), since Simca under Chrysler would have been better off collaborating with PSA during the latter’s golden era. As for Rootes without Chrysler. Even in the absolute best of circumstances with successful Imp and Swallow ranges plus related models (e.g. minus Linwood, no acquisition of Singer, no Acton strikes etc) can still see them being acquired by another carmaker (not BMC) and having their portfolio of marques reduced to a single marque. Possibly unfairly (since they certainly produced at least one car, the 1100, that led the way others would follow), I’ve always viewed Simca as being essentially an opportunistic car maker. That attitude isn’t conducive to long-term strategies. Despite taking credit for one of Chrysler’s comebacks in the early Sixties, poor product strategy was a criticism of accountant Lynn Townsend’s time as president of Chrysler. So Chrysler’s custody of Simca/Rootes should have brought some hard-headed US logic to the two brands, but unsurprisingly didn’t. I’m trying to think of exceptions which prove the rule. How about Auto Union and Land (or at least Range) Rover? Volvo seem to have survived PAG well, perhaps thorough a strategy of pretending the merger never happened. It sort of worked for Jaguar under British Leyland. Bob: there are some interesting counterfactuals in your post. What is clear to me is that Chrysler had a ragbag of failing businesses and put Simca which I don´t see as obviously moribund into the mix. They then erased the brand and its factories. I suspect that even if Chrysler had not bought Rootes they would still have mudged Simca. Have you noticed how little Chrysler products feature at TTAC? I think that is revealing. How than could Simca successfully survive as an independent carmaker without Chrysler let alone a larger 6-cylinder car? Or would Simca have been better off eventually coming full circle by later being acquired by Fiat? To be found on page 50 of Roy Axe’s “A Life in Style”. There are many other curiosities from his Rootes, Chrysler and Rover years in the book, which I’d commend strongly to anyone interested in such matters. Perhaps, but the long-nosed, and barrel sided R429 would have been at least as big as the Arrow cars. The Avenger has a wheelbase only 12mm shorter than the older car, and its tracks are around 25mm narrower. The R429 front three-quarter picture in the Axe book suggests the tracks have been increased, which makes sense as it is described as a “direct rival to Ford’s successful Capri”. What is curious is that there is no mention of a direct Arrow replacement until the C6. Perhaps Chrysler Europe thought Project 929 could take its place. The Avenger is the ‘B body’, the 180 is the ‘C body’. There’s nothing in between. Thanks for the picture and information Robertas, ordered the book. 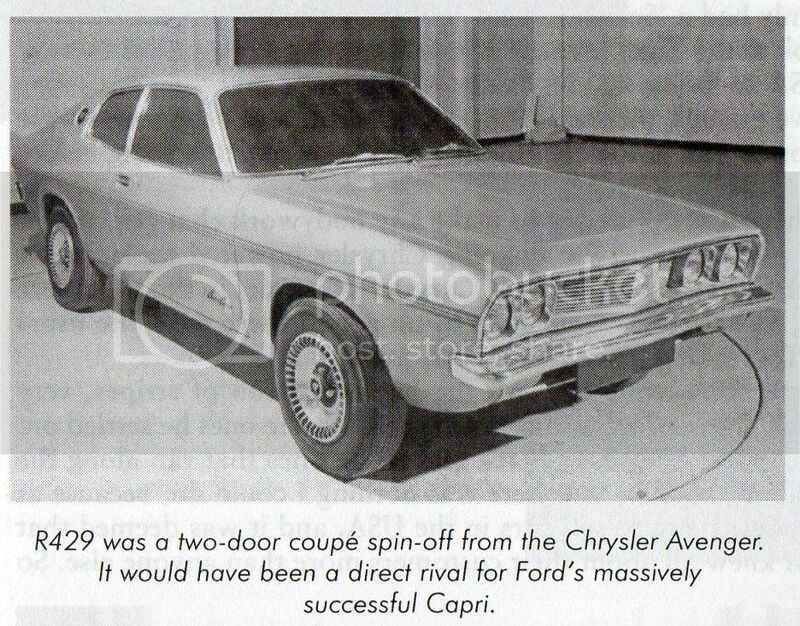 One wonders whether the R429 (particularly in 2-door Coupe form) would have better handled the shelved Rootes V6 engine that made the existing Avenger test car extremely rapid yet prone to understeer or utilized a 2-litre OHC / Twin-Cam version of the Brazilian block Avenger engine. 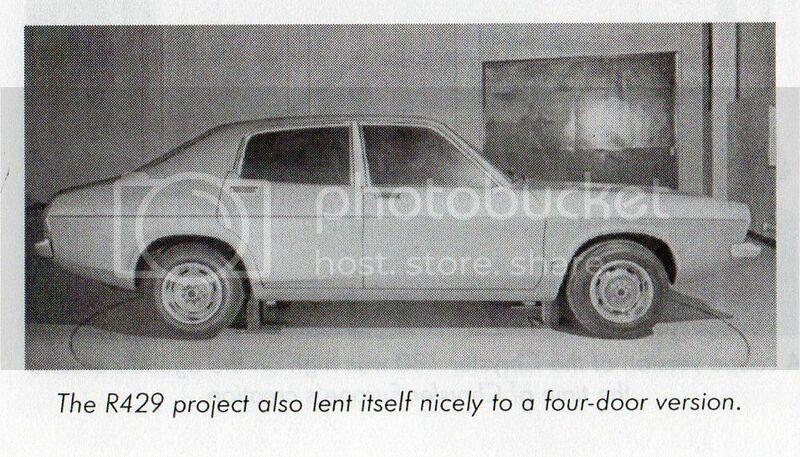 The stretched six-light hatchback Avenger might be connected to Rootes’s vision of an all-UK engineered Alpine project that was said to use a stretched and widened Avenger Estate chassis, adapted to transverse FWD and featuring 1.8-2.0-litre Twin-Cam Brazilian Block Avenger engines and 5-speed gearbox loosely in the mold of the Lancia Beta prior to the rust issues. Bob: My guess is that if Fiat had taken over Simca it would also have faded away. There wasn’t much of a difference in their market position. Was Simca struggling when Chrysler bought their majority stake? I see, was thinking of a similar scenario to how Fiat at one point considered buying Citroen (who in turn acquired Maserati). Not sure to be honest, apart from knowing that Simca were in a significantly better position compared to Rootes. Bob: Citroen had fairly different set of products. Fiat-Citroen would have been a disaster (seen from today). If anyone can guess how *that* could have made sense I’d be intrigued to hear it. As it was Fiat and Lancia had two different, complimentary markets and Fiat messed up bigly there. Yes, Simca sold lots of cars and hadn’t the welter of brands to juggle that Rootes did. Rootes was a British Chrysler, the distant runner up in most things. Fiat-Citroen likely would not have worked though it is said that what eventually became the Citroen Axel did initially make use of the Fiat 127 floorpan via Project Y. “Chrysler (is everything made by this firm some form of dross? )” A rhetorical question no doubt conceived from a high-minded plateau of intellectual thought. Still, pretty much what I consider all Fiat products to have been since the middle 1950s – utter rubbish. And I can go through the utter dross model by model they foisted on the North American market from the late 1950s till the mid 1980s, when they left. No Chrysler was as badly engineered. Not a one. I’m talking about making a reliable consumer product, not some gadfly “interesting” engineering on the drawing board like that ridiculously awful 2.5l flat four Lancia came up with. Do you think Subaru would have released an utter lemon like that? Not a chance. Daimler survived Chrysler? Here it is generally thought that Chrysler managed to survive the idiots from Mercedes, including Zetschke and his silly moustache, who ran the company into the ground. The late 1990s Chryslers were just fine and better than GM, and they were making money, which is why Mercedes bought them. The blew $40 billion getting it all wrong. I’ve worked for enough companies to know failure is management’s fault, every single time. So don’t give me the Euro shuffle about how wonderful everything there is and on some higher and sophisticated plane. If you believe it, you are deluded, pure and simple. Not much mention of Chrysler on TTAC? You must be asleep. Hellcat and Demon over and over again, Jeeps galore and the new Pacifica minivan. What you mean, I suggest, is that since Chrylers have no interest for you, you miss the obvious clues and end up with a faulty memory. Still, the chickens have come home to roost. The world’s worst major car company by far, Fiat, has taken over Chrysler. Now there’s a recipe for a total dead end – the underengineered bossing around the people who have some clue what they’re up to but haven’t had decent investment for over twenty years, using from what one gathers from the Autoextremist.com, an attitude that they know best in the fine European tradition and dismissing US engineers as peasants. So the brightest are getting out while they can. When I read stuff like this article, and the accompanying timeline on Simca, which was another loser waiting to show its true colours – let’s get real, the Simca 1000 was awful, one can only surmise that this is yet another case where I am supposed to believe that the history I experienced went through some kind of quantum warp before being disseminated in Europe and emerged in excuses that everyone else was to blame bar the Europeans themselves. And you’re still gassing yourselves to death with diesels. Delusional. Just like Fiat has been for six decades. I’m serious. I love discussing cars, old and new for the interest in a particular model. But to then carry on in some blithe generalist manner which assumes others can only agree with one’s high-falutin’ suggestion is blinkered provincialism. Hi Bill: forthright and articulate as ever, you raise some good points. First though, while I am of the view Chrysler isn’t very good one would be mistaken to think it implies automatic superiority of anyone else. You are a little harsher on Fiat than I am on Chrysler. Chrysler has purveyed characterless mediocrity (I mean “dross”) whereas Fiat has made utter rubbish for 60 years. That’s as big a generalisation as mine. As I am a natural consensus seeker I’ll say we’re both more right than wrong and Fiat and Chrysler are both a long way from very good. We can then continue to disagree as to whether well-engineered (as you claim) trumps stylish/ characterful which is futile as that’s just quantitative versus qualitative in disguise. Mercedes was wrong to buy Chrysler and yes, for a change Chrysler was making some money. The underlying character of the firm didn’t suit Mercedes and Mercedes was lucky to escape. I don’t go for ad hominem: Zetsche’s facial hair is his business. That said, you don’t go around with one of those if you aren’t actually very talented in some way. Generally, I think I’m on safe ground when I contend Mercedes has done just at least somewhat better than Chrysler in the long run. Are American engineers peasants? I can’t tell if you are attributing that view to autoextremist or to European engineers or to DTW. It’s not my view anyway. Each culture has strengths and weaknesses and I’d propose US cars are as well suited to the US as Euro cars are to Europe. Since I never had the pleasure of driving a 1000 I don’t know what it was like – that they sold two million of them suggests it was decent for its times, as European as a 5.7 litre Olds Cutlass Brougham was American. Correction: I meant to write Curbside Classics, not TTAC. One of the pictures above is captioned “Reassuringly British inside and out: the 1976 Talbot 1510”. That’s simply not true. The 1510, or Chrysler Alpine as it was in Britain featured Simca engines, floorpan and suspension. The only British aspect was the styling, lead by Roy Axe in Coventry. It was the best selling car in France for several years, so hardly a failure.